1987. Higher Diploma Fine Art (HDFA), Mixed Media, Slade School of Fine Art, University College, London. 1985. UMASS Scholarship, University of Massachusetts, U.S.A.
1984. BA Hons, Exeter College of Art & Design. (2.1). 2012- i-DAT Director of Research (Arts Council England National Portfolio Organisation). 2010- Professor of Interdisciplinary Arts. Plymouth University. 2010- School of Art & Media Graduate Coordinator. Plymouth University. 2009- Subject Group Leader for Interactive Art & Technology, School of Art & Media, Faculty of Technology. University of Plymouth. 2008-10 Reader in Digital Art & Technology, School of Computing Communications and Electronics. University of Plymouth. 2000-01 Visiting Lecturer CRD Department (Computer Related Design), Royal College of Art. 1999- Director of i-DAT [Institute of Digital Art & Technology]. Subject Group Leader, School of Arts and Media (SoA&M). Appraiser for 7 F/T and 5 P/T staff. Experiential Learning CETL Management Team, Centre for Sustainable Futures Fellow, School of Arts and Media Executive/Subject Leaders Committee, Faculty of Arts Readers and Professors Committee. University of Plymouth. 1999-02 Programme Manager of MSc Digital Futures, OnLine Masters course in digital media. Course development and validation. University of Plymouth. 1997- 2009 Interactive Media Subject Group Leader, School of Computing, Faculty of Technology, University of Plymouth. Became i-DAT in 2004. University of Plymouth. 1992-97 Programme Manager, BSc (Hons) MediaLab Arts. School of Computing, Faculty of Technology, University of Plymouth, Drakes Circus Plymouth. Polytechnic South West. Current students as DoS: 12. [Students located in i-DAT, Art and Sound, Planetary Collegium (Plymouth, Milan & Zurich) and Cognovo and ALERt Marie Curie ITN]. PhD: Internal Examiner – Plymouth University: 7. ESF (Lee Nutbean, PhD full time studentship), Onasis Foundation (Stavros Didakis, PhD full time studentship), CAPES (Jacques Chueke, PhD full time studentship), Alban (Anaisa Franco Full Time studentship), British Council (Co-Os), Artist Link Inhabit program (Cadu residency, Brazil), Canadian Council for the Arts (Marc Fournel residency and research project), Arts Council England (Grant for the Arts and project funding), Plymouth City Council (partner funding and Co-OS), AHRC (IVT workshop and Peter Fend Art Science Fellowship), EPSRC (VRC with Guido Bugmann) as well as a variety of smaller project funds from partners and collaborators. Phillips, M., Hunt, C. “Start every day off with a smile and get it over with.” XARTS 2013 International Conference- From Virtual To Real, Syros, Greece. 20/07/2013. Phillips, M. “Filled with wonder and ease…”, part of the ‘Diagrams, Formulae and Models: Aesthetic and Scientific Strategies of Visualizations’ panel. ISEA2013, Sydney. 13/06/2013. Phillips, M. Leonardo Education and Art Forum (LEAF) Theme Moderator: The role of art education in an age of ecological crisis and the globalisation of knowledge. LEAF, a working group of Leonardo ® /ISAST. 14/06/2013. Phillips, M. Presenter and Culture, Creativity, Design workshop facilitator. RCUK/TSB Internet of Things Research Road-mapping workshop. 11-12/07/2012. Phillips, M. Dirty Data. Art, Identity and the Technology of Transformation. The Leonardo Education and Art Forum: Transdisciplinary Visual Arts, Science & Technology Renewal Post-New Media Assimilation in collaboration with Rewire the Media Art History conference (supported by National Institute for Experimental Arts, Sydney Australia). Liverpool, UK, 27/09/2011. Phillips, M. Strange Material. Sony Education Forum. Cascais, Lisbon, Portugal. 08/07/2011. Phillips, M. Keynote at Research Councils UK Sandpit focusing on “Transport Behaviours, Habits and Practice” on 07/12/2010. Phillips, M. ‘A Mote it is…’ Symposium: Strange Futures: Collaborations that make nano-art. John Curtin Gallery, Curtin University of Technology, Perth, WA. 07/02/10. Phillips, M., Weaver, R., Carss. P. Human Trace, ISEA2009, the 15th International Symposium on Electronic Art (2009). Belfast. 09/09. Aga, B., Phillips M. Co-curation of www.syncretica.net is an online semantic interpretation of ‘The Syncretic Sense’ Roy Ascott Exhibition, Plymouth Art Centre. 4 April to the 24 May 2009. Phillips, M. d Rodney: In Retrospect – Talk with Mike Phillips and Geoff Cox. Iniva, London. 20/11/08. Carss, P. Phillips, M. Dome Fugue v1.0: Plymouth The Immersive Vision Theatre and i-DAT. Dome Fugue v1.0 is part of ‘Voices III’ the Peninsula Arts Contemporary Music Festival 2008. http://cmr.soc.plymouth.ac.uk/event.htm 24/02/08. Phillips, M, Aga, B., Hazelden, K.(2008) “The Play Algorithm – A(n):= [r = 1,2,…..N]”. In Deiz del Corral, A. (ed), HOMO LUDENS LUDENS, Locating play in contemporary culture and society. LABoral Centro de Arte y Creación Industrial. Gijón, Asturias, Spain: pp 244-248. Phillips, M. Curtains for the Albertian Window. Researching the Future: aspects of Art and Technoetics 2007 Prato, Italy. Centro per l’Arte Contemporanea Luigi Pecci 7-9/12/07. Phillips, M. Speed, C. Arch-OS v1.1 (Architecture Operating Systems), Software for Buildings. Engineering Nature, Art & Consciousness in the Post-Biological Era. Ed Ascot, R. Intellect. ISBN 1-84150-128-X. p 177-182. (2006). Phillips, M. Liquid Reader 3, Altered States. DVD Conference proceedings from Altered States: transformations of perception, place, and performance. A transdisciplinary conference. Ed: Phillips, M ISBN 1-84102-147-4. 22/07/05. Invited Presenter for Buro Happold Consulting Engineers (www.burohappold.com) Multi-disciplinary Engineering Workshop. “This Conversation can server no possible purpose”. London, 03/03/05. Liquid Reader™ v1.1. DVD Supplement. Jointly developed by i-DAT/ Liquid Press, Performance Research e-Publications and DeMo. Liquid Reader™ v1.1 produced by the Liquid Press, an i-DAT (Institute of Digital Art & Technology) research project. ‘On the Page’ DVD supplements Performance Research Vol.9, No.2 ‘On the Page’ (2004) issn 1352-8165. Phillips, M. Construçóes Interativas. Redes Sensoriais. Arte, Ciência, Tecnologia. eds Maciel, K. Parente. A. Contra Capa Livraria, Rio de Janerio. 2003. ISBN: 85-86011-74-6. pp149-155. (30/11/03). Book. CeBit: UK@ Stand, Hall 5, Stand F04 at CeBIT 2004, Hanover, Germany. Future Park Pavilion, UK Research and Innovation. Arch-OS represents the South West of England Regional Development Agency at the Future Parc. 18 – 20/03. Phillips, M. ‘Soft Buildings’, invited presentation to NMSI at the National Museum of Science and Industry, London. 5/02/04. Phillips, M. ‘Soft Buildings’. Phillips, M. Centro Dragáo do Mar de Arte e Cultura (Fortaleza – Ceará, Brazil. Organised byProfessor Katia Maciel, N-Imagem, Escola deComunicaçáo, Universidade Federal do Rio de Janeiro. (29-30/11/03). Phillips, M. ‘All that is solid melts into … Liquid Media’. Dept Computer Science. ETH Zurich. CH 8092 Zurich, Switzerland. Invitation to present from Prof. Moira Norrie. (03/11/03). Phillips, M. “This conversation can serve no purpose any more. Goodbye.” ‘Digital dialogue with a significant other’. Nomadische Grenzüberschreitungen / (nach) denken über kunst. Nomadic Transitions / thinking about art. Kunst und Forschung. 10.-12. April 2003. University of Art and Design Zürich. Hochschule für Gestaltung und Kunst Zürich (HGZ) www.nomadic-transitions.ch. (10/04/03). Generative Media. CAiiA-STAR Symposium, John Curtin Gallery, BankWest Theatre. Curtin University of Technology, Perth, Australia. Part of the BEAP [2002 Biennale of Electronic Arts Perth] (06/07/02). From Networking to Nanosystems a Series of Digital Dialogues and Debates, CAiiA-STAR in collaboration with ucdarnet, presentations and symposium “9/11: N2N conference”. UCSC Santa Cruz. ‘Emergent Systems’ and ‘MetaphoricNetworks’ UCLA/UC Irvine/ UCSB, Los Angeles, ‘Wireless Society’ and ‘Performance Networks’ and ‘Nano-technology & Culture and New Literacies’. (8-14/11/01). Phillips, M. ‘spectre [ˈspɛktə/]’, Schauraum. Quartier21 (Electric Avenue), MuseumsQuartier, Museumsplatz 1/5, 1070 Wien, Austria. 27.01-18.03.2012. Aga, B., Orrell P., Phillips M. Co-curation of ‘The Syncretic Sense’ Roy Ascott Exhibition, Plymouth Art Centre. 4 April to the 24 May 2009. Sonic Arts Network & i-DAT present: Expo Plymouth. http://www.sonicartsnetwork.org/expo. 16/05/2007. Hosted by i-DAT. Phillips, M. Arch-OS and Liquid Reader v1.1. Shaping Consciousness: New Media, Spirituality, and Identity. Project X Theatre. Dallas, Texas, USA. 09/04/05. Phillips, M. ‘Psychometric Architecture’. QI and Complexity – 24 – 27 November 2004. Red Gate Gallery, Levels 1 & 4, Dongbianmen Watchtower Chongwenmen, Beijing, China. Portland Square Plymouth University, The Digital Media Studio, Central Academy of Fine Arts, School of Software and Peking Univ. The Institute of Digital Media, Beijing Normal Univ. Three location telematic video system. (11/2004). Phillips, M. Constellation Columbia”, prototype monument for ‘Dead Astronauts’. zero gravity work for Parabolic flight from the Gagarin Cosmonaut Training. Centre, Russia. Courtesy of The Arts Catalyst: MIR Campaign 2003, Gagarin Cosmonaut Training Centre, Russia. MIR Campaign 2003 supported by the European Commission Culture 2000 Fund. Search for Terrestrial Intelligence, part of Landscape Trauma, Autograph touring show, Leeds Metropolitan University Gallery. 11-12/01. Phillips, M. ‘Narcissus v1.0’. The Search for Terrestrial Intelligence. SciArt Symposium presentation at Creating Sparks Conference, Royal geographical Society, London. (06/2001). Phillips, M., etal. ‘Search for Terrestrial Intelligence’, STI consortium, as part of ‘Landscape Trauma’, Autograph Touring Show, Café Gallery, London. Phillips, M., etal. ‘Artefact’, with support from inIVA, i-DAT, Middlesex University, V&A). Digital Responses series of exhibitions in Gallery 70 at the V&A, May 16 2002 to 12 February 2003 at the Design Now Space: 20th Century Gallery 70, at the Victoria and Albert Museum, London. 05-06/01. ‘Autoicon’ CD-Rom (collective), part of exhibition, ‘Art In Motion II’, Santa Monica Museum of Art, Santa Monica CA, USA. 2001. Co-I: EU FP7 Marie Curie Initial Training Network (FP7-PEOPLE-2013-ITN-IDP 604764; 2013-17 €4.1m) “CogNovo: Cognitive Innovation”. Using creative technologies to promote behaviour change. 2013. Co-I: EU FP7 Marie Curie Initial Training Network (FP7-PEOPLE-2013-ITN-IDP 607996; 2013-17 €3m) ALErT, developing immersive geological simulations. 2013. Co-I: EMDL (European Mobile Dome Lab) EU Culture Programme. Strand 1.3.5, Cultural Cooperation projects with Third Countries: €400k. 2013. Aga, B., Phillips, M. CO-OS, 12 month, British Council. £25,000. (2009-2010). Aga, B., Phillips, M. Research Fellowship- ‘Creative Producer’, 18 month, Arts Council England, Grants for the Arts, with partnership funding from AimHigher and Plymouth City Council. £58,000. (2008-2010). Aga, B., Phillips, M., Speed, C. ‘Cornwall Culture’. Interactive Pod Commission for Cornwall Arts Marketing. Member of the i-DAT development team. £125,000. 01/06. Phillips, M., Speed, C. ‘EMPOD’, Scanning Electron Microscope Simulation interactive pod with the Plymouth Electron Microscopy Centre for the National Marine Aquarium Explorocean Centre. Member of the i-DAT development team. £25,000. 01/06. Phillips, M. Research Fellowship- ‘Outreach Curator’, 2 year, Arts Council England, Grants for the Arts, with partnership funding from AimHigher and Plymouth City Council. £63,000. (2005-2007). Phillips, M. Infinite Infants, 3 year PhD Studentship, funded by Creative Partnerships. £49,394. (2005-2007). Thomas, P. Malcolm, C. Phillips, M. i-500 Project. Public Art work commission following an open competition (incorporating Arch-OS), to develop an artwork for the Curtin University Minerals and Chemistry Research and Education Building. Commission by Curtin University of Technology, John Curtin Gallery and Woods Bagot Architects. AU$230,000.00. 02/2010. Phillips, M. Proof of Concept funding University of Plymouth for the development of Arch-OS, Architecture Operating Systems. £5000. Project start 10/07/04. Liquid Press collaboration with ACE/AHRB Science Art Reseach Fellowship, Dr Rosaleen A McCarthy (University of Cambridge)and Research Fellow Wayne McGregor. Choreography and cognition: a joint research project. £5,000. Project coordinated by Phillips, M. 09/03-07/04. Proof of Concept funding from Dartington College of Art. Liquid Press collaboration Performance Research Journal 9:2 ‘On the Page’ Artist’s Commissions. DVD Project coordinated by Phillips, M. 10/03-06/04. Am-I-able Network: International Participant with the Am-I-able Network led by Simon Fraser University. The Network is pursuing research focused on enabling new modes of expression and experience of culture through the use of ambient intelligence technologies. The project is funded through a grant by the New Media Research Network fund at Canadian Heritage. Participants include: Banff Center for the Arts, Concordia University, K3 Malmo, V2 and Art Institute London. CA$250,000 (aprox) (2003-2007). Transmedia Publishing TCS (KTP), with CMA Yealmpton Plymouth, TCS Programme: 4308. (£111,000 aprox). 2003-2005. Lead Academic, Phillips, M.
Global Feed. Arts Council England/AHRB Arts and Science Research Fellowship for Peter Fend. In collaboration with Dr Guido Bugmann, Dr Samantha Lavender, Professor Stephen Hughes. £35,000. (2003). Principal Investigator: Phillips, M.
Commission and Funding for the development and installation of the Arch-OS ‘Cybrid’ project for the Portland Square development from the University of Plymouth and the Peninsula Medical School. (£25,000 hardware, £5000 Research Assistant). (2003). Development of Liquid Media software solutions for the Broadband4Devon, Project European Regional Development Fund (ERDF), South West of England Objective 2 – 2000/6, With Devon County Council. Total grant £12,352,000. Liquid Media component coordinated by Phillips, M. £50,000. (2003). Liquid press produces DARE CDROM. For the Institute of International Visual Arts. £8,000 inIVA. Project coordinated by Phillips, M. 08/03. http://www.iniva.org/publications/index. Applause South West. NOF -digitise National Programme. The Council of the City of Plymouth, The Theatre Royal, The South West Film and Television Archive. Liquid Press collaboration NOF Applause South West, i-DAT.www.applausesw.org. £18,000. Phillips, M. 2001-2002. Wellcome Trust (with ACE and Calouste Gulbenkian Foundation) SciArt grant for the STI Project (Search of Terrestrial Intelligence). £10,000. 2000-2001. Principal Investigator Phillips, M.
Phillips, M., Rodney, D., et al. ‘Autoicon’. Arts Council of England and inIVA. £10,000. Bennett, J., Phillips, M. PIM (Peninsula Interactive Media Association). (£30,000 ERDF). 2000-2001. TCS. Insight Training Solutions Ltd. 1997-1999. £(70,000 aprox). 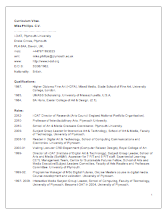 Lead Academic, Phillips, M.
TCS Orange Group Ltd. 2000-2002. £(70,000 aprox). Lead Academic, Phillips, M.
2013 AHRC Internet of Things Advisory Board. 2012 Review Committee, Mutamorphosis: Tribute to Uncertainty, Prague, Czech Republic. 2012 Review Committee: ISEA2012, New Mexico, USA. 2012 FullDome UK 2012 Organising Committee. National Space Centre, Leicester. 2012 Programme Committee Member: DOMe-IoT 2012, Pittsburgh, PA, USA. 2012 REACT AHRC HUB Advisory Board Member, UWE. 2012 Scientific Committee. Workshop in Immersive Cinema. Navegar – Foundation for Cultural, Artistic and Scientiﬁc Development of Espinho, Portugal. 2012 ISEA2012 International Program Committee (IPC). 2011 Award of Honoured Professor, Donghua University, China. 2011 Program Committee for iHCI 2011, Cork Institute of technology, Cork, Ireland. 2011 Review Committee: ISEA2011, Istanbul, Turkey. 2009 RE:Live Media Arts Histories Review Panel, 2009. 2007 Perth DAC 2007 review panel for the 7th Digital Arts and Culture conference, Perth, Australia. 2007 Creativity and Cognition 2007 Program Committee. 2007 Hexagram Evaluation Committee, Hexagram Institute for Research / Creation in Media Arts and Technologies, Montreal, QC Canada. 2007 ISEA2006 International Program Committee. 2006-8 Director of Plymouth Media Partnerships. 2003-07 Am-I-able Network, funded by New Media Research Network fund at Canadian Heritage, (2003-). 2001-08 Extended period on the Arts and Humanities Research Council Peer Review College of Assessors. i-DAT is an Arts Council England National Portfolio Organization and a Lab for creative research, experimentation and innovation located in Plymouth University. Established in 1998 i-DAT continues to provide a platform for a interactions with practicing artists, arts organisations and cross sector industries. Its creative and technical productions build on a strong practice based research ethos to engage new audiences and develop new art forms. i-DAT is constituted as an ACE NPO, under the governance of Plymouth University and the organisational requirements of ACE. http://www.i-dat.org. i-DAT management is constituted as: Director of Operations, B Aga, with a broad range of experience of open innovation through Future Lab, Pervasive Media Studios and Lotto Lab; Director of Research, Prof Mike Phillips, an expert in transmedia publishing and digital art; Technical Producer, Dr Simon Lock, software artist and data visualisation; Creative Producer, Gianni Corino, an interaction design and Internet of Things specialist. Dawkins, U. Envisaging the Unseeable. 2013. RealTime Arts – Magazine – issue 96 [ONLINE] Available at: http://www.realtimearts.net/article/96/9816. [Accessed 06 May 2013]. Greenfield, A. Everyware, The Dawning Age of Ubiquitous Computing. New Riders, Berkley. 2006. Arch-OS referenced pp 60-61. Colson, R. The Fundamentals of Digital Art. Ava, Lausanne, Switzerland, 2007. Slothbot referenced pp 78-79. Supervision of Industrial Placement student. 2007-10 TQEF RiT (Research Informed Teaching) Projects ‘Development of multi-disciplinary content for the IVT’ and ‘Development of a Cross-Faculty Centre for Creative Design and Technology’ (reports submitted 04/2009, Phillips, M. and James, N.). 2000 Founder and Director of the Institute of Digital Art and Technology, University of Plymouth. Funded by ERDF Award £11,640, HEIF/RDA Award £38,774 and ESF & HEROBIC Award £116,406. 1997-04 Deputy Director of STAR (Science Technology and Arts Research) PhD Supervisor / researcher. The STAR research group became i-DAT on the demise in 2004 of CAiiA-STAR Integrated PhD Programme, which became the Planetary Collegium. 1997- Interactive Media Subject Group Leader, School of Computing, Faculty of Technology, University of Plymouth. Became i-DAT in 2004. 1994-98 Staff Development and Industrial Courses: Discovering Multimedia, Exploring Multimedia, Producing Multimedia. A variety of short courses delivered by satellite. 1989-92 Lecturer Media (New Technology), Full time. Exeter Faculty of Arts & Design, Polytechnic South West. Specific responsibilities for coordinating: Media Technologies, 3rd Yr Fine Art 4D (film & Video). 1988-89 0.5 Full time Lecturer Film, Video, Publishing, Department of Arts Communication, Exeter Faculty of Arts & Design, Polytechnic South West. P/T lecturer – Media/Time Base, North Devon College of F.E. 1987-89 Fellow and P/T Lecturer on: Publishing & Book Production (Postgraduate); Film & Video (Fine Art B.A. );Photo/TimeBased (BTEC); CAD, 3D (B.A.). Exeter College of Art & Design. 1985 Teaching Assistant In Narrative & Documentary Video module B.A. & M.A. students, Faculty of Fine Art, University of Massachusetts. 2010-11 External Examiner Bartlett School of Architecture, UCL, MArch. 2005-9 University of Abertay Dundee MA in Computer Arts. 2004-8 External Examiner MA Interactive Media Bournemouth University. 2001-03 External Examiner BSc Multimedia Technologies. University of Greenwich (including one changeover year for SE Essex). 2000-03 External Examiner BA Multimedia. University of Wales College Newport. 2001-03 External Examiner BA and BSc Multimedia. Faculty of Applied Design & Engineering Swansea Institute. University of Wales. 1999-2001 Partner College Liaison Digital Media related subjects. 1999 Founding member of STAR (Science, Technology, Arts Research) Centre in collaboration with CAiiA (Centre for Advanced Inquiry in the Interactive Arts. TSL funding for the ‘Virtual Advisor’. WWW based industrial liaison between students / staff / industry. (£5,000). 2007 FdSc Substance Misuse Counselling, City College Plymouth. Chair. 2006 MA Communications Design, FoA, Chair. FdA Small Business Development, Cornwall College. Chair. FdA Lean Manufacturing and Processing, Cornwall College. Chair. 2005 FdSc Agri-Foods, Duchy College. Chair. FdSc Sustainable River Basin Management, Duchy College. Chair. 2004 MA Contemporary Film Practice, Faculty of Arts UoP. 2003 FdA Sound and Music Technology, Estover College. Chair. 2002 MA Media Art DigitalDebates, Faculty of Arts, UoP. Chair. BA Digital Art & Design, Faculty of Arts University of Plymouth. Chair. 2000 MSc Digital Futures. Programme development and validation. 1998 BA (Hons) Cultural Practice, Exeter Faculty of Arts and Education, UoP. Course Development/Validation of BSc (Hons) Multimedia Production and Technology, School of Electronic Communication and Electrical Engineering, Faculty of Technology, University of Plymouth. 1992 Course development/validation of BSc (Hons) MediaLab Arts, School of Computing Faculty of Technology, University of Plymouth. 1991 Course Development/Validation of Postgraduate Diploma in Publishing and Book Production. Exeter Faculty of Arts and Design, Polytechnic SouthWest. 1989 Course development/validation team of BA (Hons) Media Combined Arts, Exeter Faculty of Arts & Design, Polytechnic SouthWest.